This is an edited extract of a speech delivered to open the Australia-UK Asia Dialogue, co-hosted by the Lowy Institute and Ditchley Foundation, and supported by the Department of Foreign Affairs and Trade and the Foreign and Commonwealth Office. Whether or not Brexit was a wise move for the United Kingdom, British efforts in the aftermath to push the case for a ‘Global Britain’ are both sensible and inevitable. Britain is right to remind itself and others that it remains, among other things, the world’s fifth largest economy, a member of the UN Security Council and of the nuclear club, and a significant player in many global activities. An increased British diplomatic and economic presence within the Indo-Pacific is a welcome development. But the accompanying promises of greater military engagement in the Indo-Pacific and elsewhere do not ring true. Britain has still to come to terms with its own military limits and the extent of the decline in national power from its age of global empire and global reach. Its armed forces have gone far past the point at which their capabilities are aligned with rhetoric of this sort. For example, the recall of a defective Type 45 destroyer from a planned Gulf deployment means there is currently no major surface combatant east of Suez, or even one outside UK home waters. The absence of such units from east of Suez is the first time this has been the case since at least the Falklands war of 1982. The total concentration of major surface warships in and around Britain is even more significant, in that it breaks a continuity of overseas deployments that is hundreds of years old. This is not a case of relative but absolute decline. When I first served on loan to the Royal Navy nearly forty years ago, there were some 65,000 people in British naval uniform. There are now 23,000. Where once were more than 50 frigates and destroyers in commission, there are now 19. At least two of these are immobilised because of personnel shortages and others have reduced crews. Britain is also struggling to maintain its nuclear submarine force. Similar reductions extend to every force element but one, the new carriers – and the state of their nascent air groups is itself a concern. The deterioration of the pound sterling against the US dollar means that the F35 fighter aircraft will be very much more expensive than planned. This is particularly serious because the annual defence budget shortfall is already approximately £2 billion and rising – and the signs are that the F35’s final numbers will be much smaller than originally planned. The Army and Air Force are in little better shape, a point recently made by a former chief of joint operations to the House of Commons Defence Committee. Britain is currently engaged in a ‘mini Strategic Defence and Security Review’ that could well result in further cuts to all three services. Despite these pressures, the British government has declared that frigates will be sent to the Pacific in 2018. 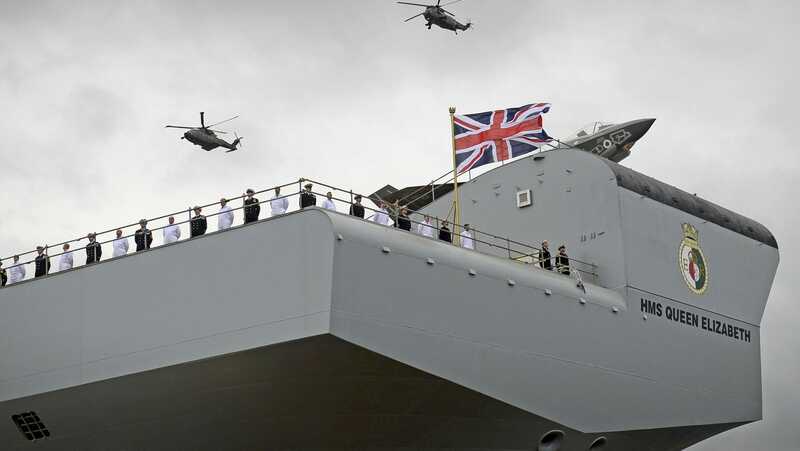 The promised deployments may be a valuable signal of British interest, but single- or even two-ship efforts run the risk of appearing as tokenism in an environment in which both resolve and military weight are increasingly important. Britain’s Foreign Secretary Boris Johnson seemed to recognise this when declaring at a speech to the Lowy Institute in June that ‘one of the first things we will do with the two new colossal aircraft carriers that we have just built is send them on a freedom of navigation operation’ to the South China Sea. It is true that Johnson almost immediately walked back in some degree from this remark, but it had been said. Neither HMS Queen Elizabeth nor HMS Prince of Wales will be ready to deploy with their supporting task groups for some years. But the real problem is that if Britain comes out to the Indo-Pacific in a such big way, even for a few months, there will be practically nothing left in the naval locker for contingencies closer to home. This matters when Russia’s behaviour in eastern Europe remains problematic and western Europe needs reassurance and support. I have elsewhere suggested it is time Australia stopped the semi-permanent assignment of a Royal Australian Navy frigate to anti-piracy and counter-terrorism operations in the western Indian Ocean. This would help generate the capability for further Southeast Asian task group deployments such as the recent 'Indo-Pacific Endeavour' operation. In the same way, Britain should be focussing its armed forces on Europe and its surrounding seas where such a concentration of effort can more readily provide the necessary military weight – and be sustained. A UK carrier battle group would be much more fruitfully employed and would be a greater contribution to the western alliance in the Baltic, Mediterranean and Norwegian Seas. Given that the Royal Navy also has commitments in the Caribbean and the Persian Gulf, the reality is that even this more restricted approach would be demanding on the force structure that remains. Such greater focus in the use of our military does not mean that either country should hesitate to use its influence or to push its views on a global basis about matters such as, in Britain’s case, the South China Sea or in Australia’s, the goings-on in Ukraine. There will also still be a place for making limited military commitments, of which Britain’s involvement in the Five Power Defence Arrangements is a good example. But present realities mean that we need to think very carefully about how we allocate our military efforts as a whole, all the more because we are dealing with nations with the attitude famously, if apocryphally displayed by Joseph Stalin when he is supposed to have asked, ‘How many divisions does the Pope have?’ What we are faced with is creating and maintaining a balance of power in a competitive environment. Such a balance requires the correct distribution of strategic weight and both Britain and Australia need to be disciplined as to where we assign and operate our forces.